Rombo.Metal is very good at modelling rough metals thanks to its multiple-scattering BRDF implementation and rough Fresnel. However despite the name, supporting custom IORs and having a slot for Diffuse, Rombo.Metal is actually able to model anything that appears just ‘rough’. 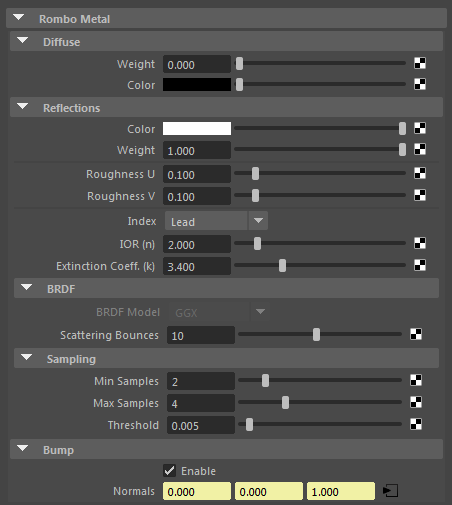 Here a little introduction to its easy to understand parameters. Diffuse is there just if you have to model something else than Metal or if you want to implement diffuse patina and dirt for example. So let’s start with the self-explanatory Reflection.Color. Metals as opposed to other materials have tinted speculars. For example if you’re modelling a Copper material you should use a pinkish reflection color, for Gold a yellowish color and so on. When we want to add scratches or dirt or just to break a bit the specularity in our metals we gonna use Weight. Generally it’s where we plug a black&white texture to give our material some variations. Roughness is where we control the fuzziness of our reflections. If we use different values for the UV slots we gonna make anisotropic reflections. To add some attenuation to our reflections and so model specific materials we use IORs N and K parameters. For easy of use we can select directly an entry from the Index parameter that will fill N,K with correct values for the selected metal. Setting Index to Custom will leave us free to use any N,K value. For a list of IOR values we can go to https://refractiveindex.info/ and lookup some values there. N is the actual refractive index while K is the extinction coefficent. We can then choose a BRDF model for our reflections. A BRDF model defines among other things how normals are distributed when treating the surface as a microsurface composed of microfaces. Those little (less than a pixel) faces orientation defines our rough surface. 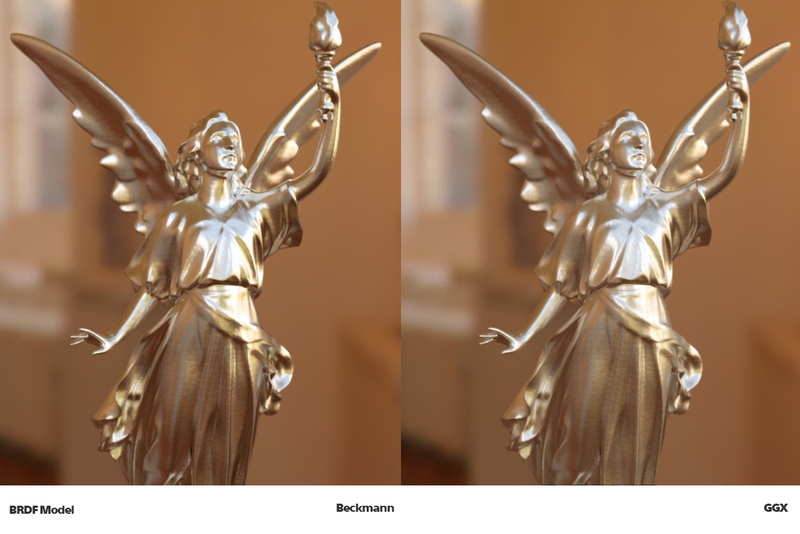 Beckmann is a classic distribution and resembles a simple gaussian blur. However for some materials it better fits than the new GGX distribution. Take care also that GGX has a longer ‘tail’ than Beckmann so it’s way more difficult to sample. When in doubt and if we’re not modelling specific metals always use Beckmann. However for rough metals like Aluminium, Silver etc. GGX is far superior. Beckmann is only available when doing single-scattering. 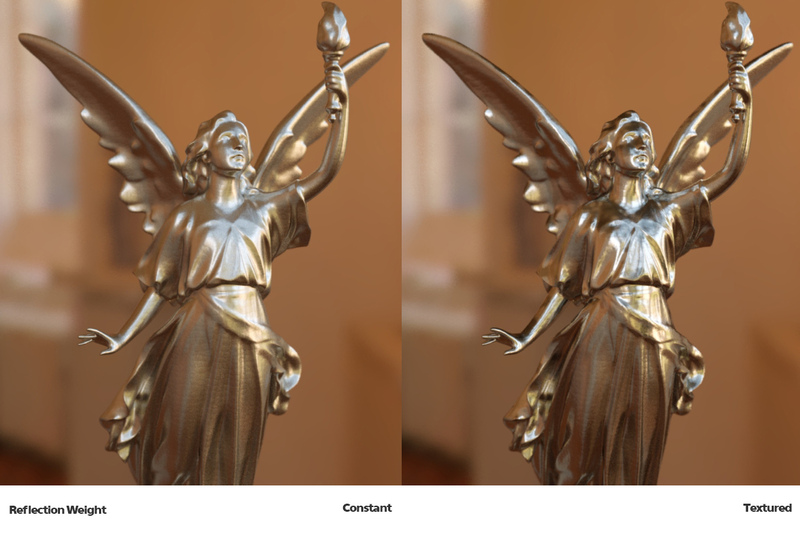 When modelling very rough metals, – multiple-scattering is a must. 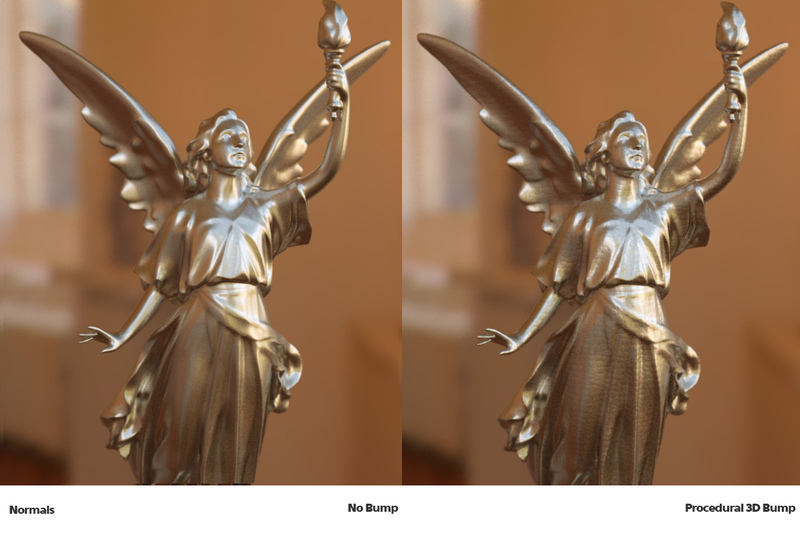 General BRDF implementations are single-scattering and so they’re not able to model rough materials because there’s too much energy loss due to considering only one single reflection bounce. One thing to say is that multiple-scattering is a ‘statistical’ approach … we don’t trace more reflections rays nor we do geometric or spatial calculations so render times are almost the same and thanks to our adaptive sampler, ‘fireflies’ won’t be present as for the original implementation. We can add bump to reflections by adding a bump2D/3D Maya node to the Normals slot under the Bump rollout and checking the Enable slot. For sampling parameters we’re adding a blog post dedicated just to that. This entry was posted in Rombo.Material. Bookmark the permalink.